Now that Celaena has become the royal assassin for the King of Adarlan, her job is to dispose of enemies of the crown. However she does not bear to kill those people and every death Celaena fakes, every lie she tells, puts those she loves at risk. Her story continues as she tries to discover the dark force responsible for making the king as powerful as he is. Celaena’s romantic relationship with Chaol develops throughout this book, while Dorian learns he possesses powers that should have disappeared almost 10 years ago. The book ends with Celaena travelling to her homeland, ruled by the Queen of the Fae, as we learn that Celaena is a Fae herself and in fact she is Aelin Ashryver Galathynius, lost Queen of Terrasen. To start off this review, I must say it is a much better book in comparison to the first one in the series. We finally see the assassin we’ve been hearing about all through-out the 1st novel. 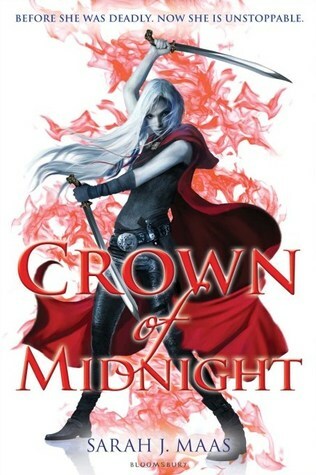 “Crown of Midnight” has its flaws but overall it was an enjoyable read. To summarise, I did not enjoy the first book, “Throne of Glass”. It lacked any character development, the story was slow and not filled with purpose. But “Crown of Midnight” fixed all of that. The story was filled with well thought out action, some romance, betrayal and political clashes. It felt as if it was proceeding naturally with a good pace. It doesn’t feel as if any important bits of the plot are skipped over, as I found to be the case with the author’s other series, ACOTAR. There were exciting twists and turns, I predicted some, other I didn’t see coming, but either way they weren’t coming out of nowhere, they were well set out. When it came to the main character, Celaena, she finally shows us the assassin she is supposed to be! There were scenes where we finally get to see her dark side, her skills and cunning planning. And she has flows, she finally stopped being perfect and annoying. Both, the character development of Chaol and Dorian were satisfying as well, even thou Dorian still remains boring. I didn’t like Nehemia, I do not see much purpose in her, except to set off Celaena’s raged filled side, so I was happy to see her gone. I think that friendship wasn’t particularly well developed on its own, I didn’t feel as if those two women were truly best friends, there was barely any important dialogue between them and they constantly lied to each other as well. There were few significant flaws in this book, that made me roll my eyes. First ones were the confrontational dialogues of Celaena with other characters. During the fight she would end the conversation by storming out of the room, before the other person could reply. Now, doing something like this doesn’t make you scary. It actually makes you look like you don’t have the control over a situation and this is a cheap attempt to try and gain it back. The reason I bring that up is because I counted at least 3 times when that happened and I don’t think this behaviour is appropriate of a supposed Adarlan’s Assassin, it made Celaena’s character less believable. The next one is the love triangle between Celaena, Chaol and Dorian. It seems to be a persistent theme in Sarah J. Maas novels and even thou the romance between Celaena and Dorian wasn’t there in this book per say, it still created a sort of drama cloud over everybody, causing childish envy. I simply find it useless, it provided no significance to the story in my opinion. The last one is the usual when it comes to Sarah J. Maas, the abuse of the phrase ‘clicked his/her tongue’. I can’t stand this, it makes no sense. But that is not so much the flaw of the book as much as that of the author, because the exact same phrase appeared in the ACOTAR series through and through. Despite all that, I am glad to see such a huge improvement from ‘Throne of Glass’. Everybody with whom I talked about ToG series as a whole says the same thing, it gets better after approx. 2.5 books, i.e. Middle of 3rd story, and so after being so positively surprised by Crown of Midnight, I am looking forward to continue Celaena’s story in the 3rd instalment, titled ‘Heir of Fire’. Yeah, the first two books aren’t as great as the second too but the rest of the series 100% makes up for that. Heir of Fire might actually be my favourite of the series, not counting Tower of Dawn! Sarah J. Maas has such a way of creating these immersive character and their character arch is always amazing to watch.